The world's first wristwatch with a built in dual frequency Personal Location Beacon, the Breitling Emergency is a safety and survival instrument for professionals and adventurers. With LCD display and powered by SuperQuartz movement ten times more accurate than standard. 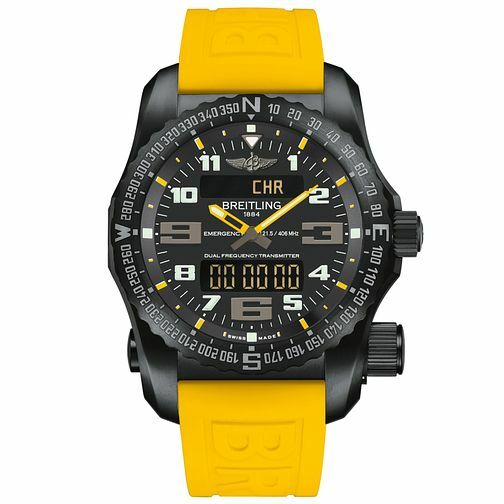 Breitling Professional Emergency Men's Yellow Strap Watch is rated 4.0 out of 5 by 1. Rated 4 out of 5 by Anonymous from not bad for a budget option This is a fun watch that'll suit the more casual user. If you're on a budget and looking for something that will handle day to day use then I strongly recommend. For something for serious I reckon it'll be better beyond this model though, it's at the cheaper end of the spectrum and therefore not best for the more serious user.